There is so much love that we have for each and every one of you! We would not be able to create such lovely darlings without the love and support that you have given us over the years. We encourage you all to let the people you love know how you feel about them and to let others know how they have made you feel good and special. As usual this blog sale offers first dibs on our new spun cotton one-of-kind figures. If you see something(s) you love, just email us at crystalandben@vintagebycrystal.com and we'll let you know if they're still available and if they will be reserved for you. First come first served! we'll update item status in this post as often as we can to make it easier for you to know what's available. Items often get scooped up quickly, so make your selection as swiftly as you can, you can always add available pieces to your order later. Also feel free to include second choices in case your first choice is unavailable, but make sure you label them "second choice". Click on photos to enlarge. Shipping is $3.50 for one item and $1 per additional item up to $6.50, then additional pieces are free. All paid orders will ship out immediately via first class mail and should arrive within a few days. If you prefer 1-3 day priority shipping, please let us know (there will be an additional $3 charge). After we confirm that the item(s) you requested are reserved for you, we'll send you a Paypal invoices via email for payment. Please feel free to email us if you have any questions! Valentine's Day Blog Sale Sneak Peek! Here's a little preview of what's in store for Tuesday's Valentine's Day Blog Sale! 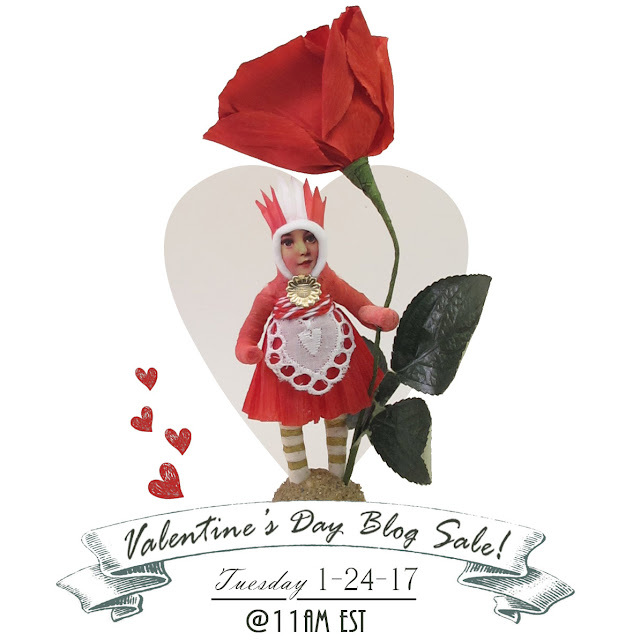 Valentine's Day Blog Sale Announcement! The Blog offers first dibs as usual and if you'd like to be notified about upcoming blog sales and special events, just sign up for our mailing list on the right side of our blog, or leave a comment with your email address.